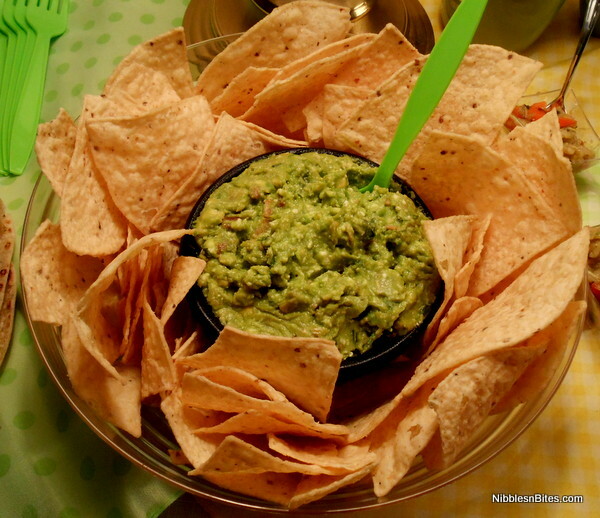 National Guacamole Day Dip & Sip? Challenge Accepted! I’ve always loved playing hostess at parties and I’m so lucky to have found, in Todd, a willing accomplice to party perfection. We try to throw at least one good-sized party a year (with written invitations, party favors, etc.) but with this year’s bash being the wedding (in 47 days–holy cats it’s getting close! 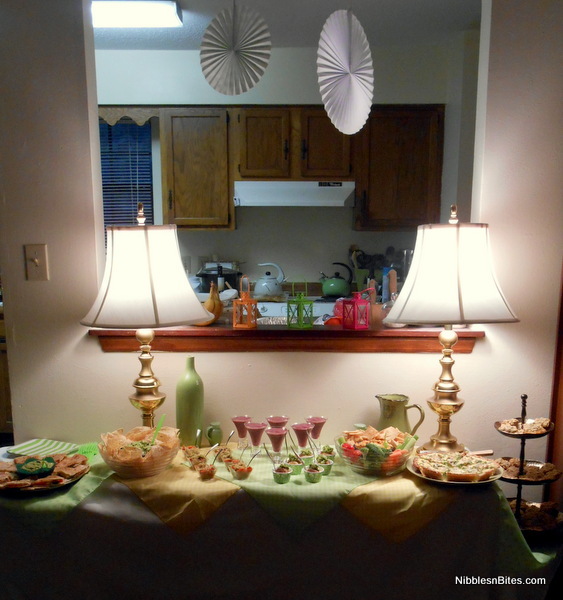 ), at-home entertaining has taken a back-seat. Sure, we have our group over for regular game nights but it’s just not the same. Which is why, when I was invited to participate in the Dip & Sip Challenge in honor of National Guacamole Day (today, September 16) and sponsored by Piedra Azul Tequila, I jumped at the chance. 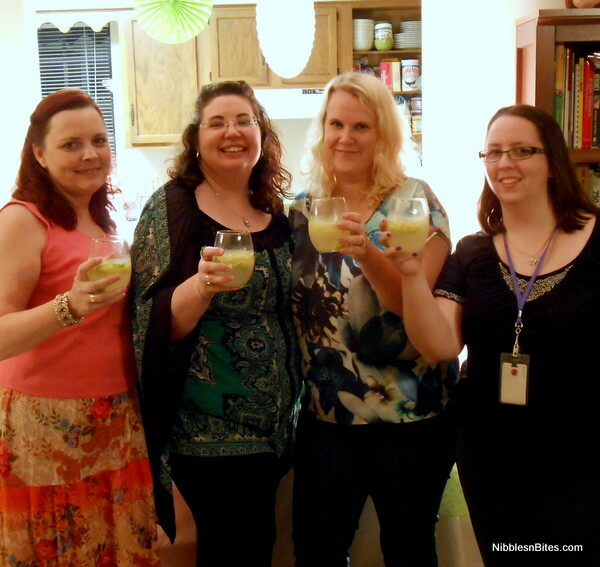 The idea was that, as participants, we invite folks over to share some delicious guacamole and tequila cocktails and blog about it–it was just the kick in the pants I needed to stop focusing on the wedding for one night! Participating bloggers received a bottle of Pedra Azul Tequila, a copy of Gaby Dalkin’s new Absolutely Avocados cookbook, and a $25 gift card to Whole Foods (ours opens in less than a month and I can hardly wait to have one nearby, finally!). For the past few months I’ve been hosting craft nights every other Wednesday, so I decided to capitalize on the fact that I was already planning to have friends over on the 11th and described the evening (in the Facebook invite) as “A Very Special Mid-Week Create Break.” Apparently I should have started theming the nightsÂ way before now as this week’s craft night garnered loads more interest than previous ones! (Even though a few girls had to bow out at the last minute due to life–unfortunate that life should get between us and tequila, but that’s the way it goes some days.) Our usual m.o. is to open a bottle of wine, pop in a chick-flick, and craft and chat for a couple of hours. This week’s wine would be a new tequila cocktail and this week’s movie would be Selena–though sometimes we talk more than watch, it’s nice to have something on in the background. Gaby Dalkin, author of Absolutely Avocados, will be judging our Dip & Ship Challenge experiences! Reading through Absolutely Avocados for inspiration, there were justÂ so many good ideas I found it difficult to limit myself to just one or two items. So I said to hell with it and ended up making 9 of her recipes to make sure we had a good smattering of avocado options and guarantee that there’d be something that each guest would love. I needn’t have worried, though: everything went over like gangbusters! Now, to make this work on a weeknight (without taking a day off of work, that is), I did some preliminary staging on Monday night along with making my shopping and prep lists. There may have been spreadsheets involved. (Okay, there was definitely a spreadsheet involved.) Back at the beginning of the summer I’d received a box of goodies through Oriental Trading Company‘s Blogger Outreach program and (again, the whole lack of entertaining thing this year) hadn’t had a chance to use them. 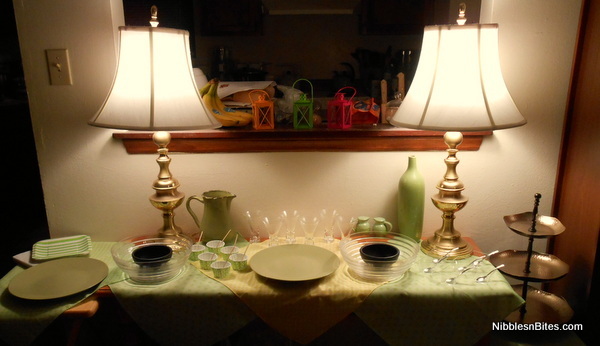 Since the plates, bandanas, cutlery, cups, and lanterns were all in these great spring greens and such, I figured they’d be a great way to dress up the serving area for our tasty treats and pull everything together nicely. A rough draft of how the food table would look. Tuesday night saw me picking up the last few necessary ingredients and doing all the food prep I could possibly do. 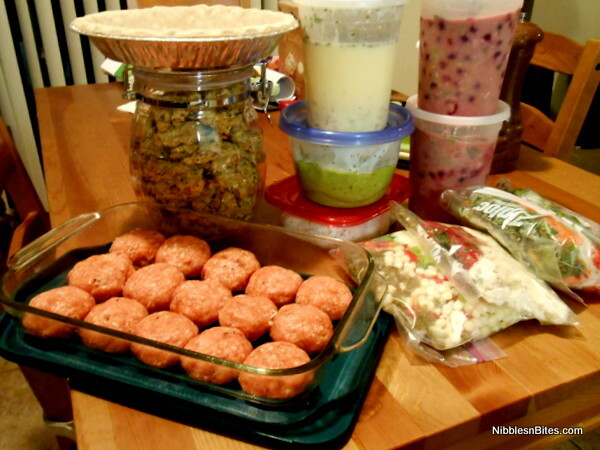 I baked the cookies, made the salsa, and blind-baked the crust for the quiche as well as all the other slicing and dicing possible–storing most things in quart-sized baggies, some in recycled take-out soup containers–short of actually cutting the avocados. Since they brown so easily, it was enough to get everything else done so that the next night would just be a matter of assembly and final cooking. What 5 hours of concerted effort looks like. Wednesday night I chopped about a dozen avocados (my success rate for cleanly getting the pits out of the avocado halves is about 1 in 3 at this point). I started the quiche in the oven, set up the rice cooker (one less thing to monitor over doing it on the stove), and got the blender and food processor going. As soon as the quiche came out the turkey sliders went into the oven and as each item was completed, it could immediate go out into the serving area. Because I’d decided where and on what each item would go the night(s) before, there was no mad scramble at the end to make everything fit. 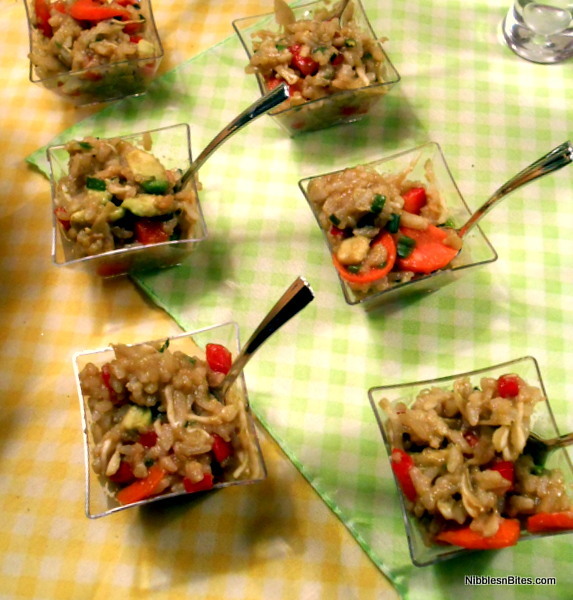 By the time most of our guests arrived at 7:30, I was simply waiting for the sliders to finish as Todd put the cookies out and I mixed the veggies and dressing in with the finished rice. So incredibly rich; I used a pre-made gluten-free pie crust and subbed plain Greek-style yogurt for the heavy cream. 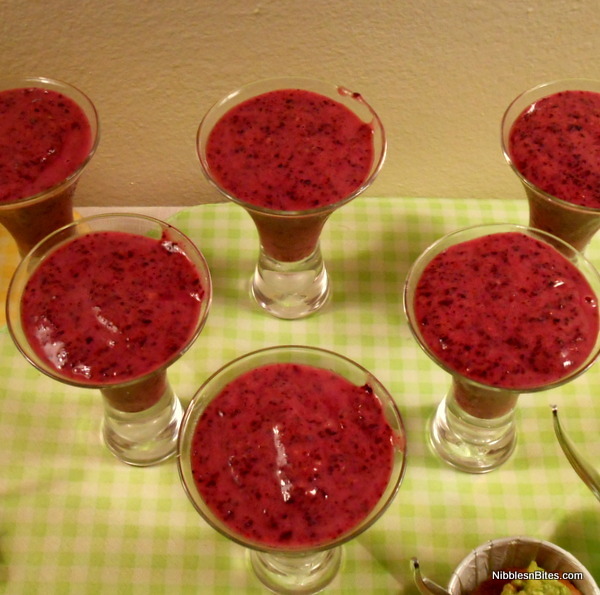 The latter reduced the lactose-load, making it more Low-FODMAP friendly. It did take a bit longer to bake than the recipe specified, but that could be partially because I’d mixed the filling the night before and it was still a bit chilly when it went into the oven. Oh, man. 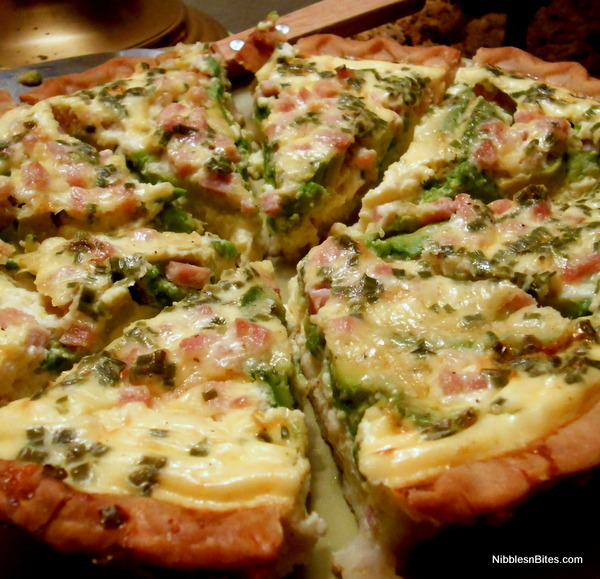 Bacon, cheese, and avocados–there is nothing whatsoever wrong with that combination! This is a hearty guacamole that is so good I’ve found I can only eat a little of it at a time. Like really good chocolate or really rich ice cream. A little goes a long way, even though you don’t want to walk away from it for a moment. 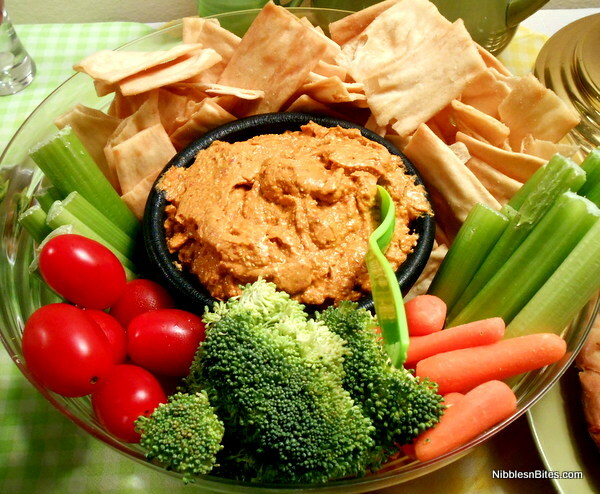 One of the ladies I’d invited doesn’t eat pork, so I wanted to make sure I had a alternative dip and this feta and roasted red bell pepper concoction really fit the bill. Not only did it offer a change in flavor from the usual guacamole, it also offered a change in color as well. Since the recipe calls for both fresh garlic and olive oil, I substituted garlic-infused oil to get the flavor across without pushing this into High-FODMAP territory. While I know everyone liked these, they were what I ended up with the most of as leftovers and let me tell you I am not complaining! 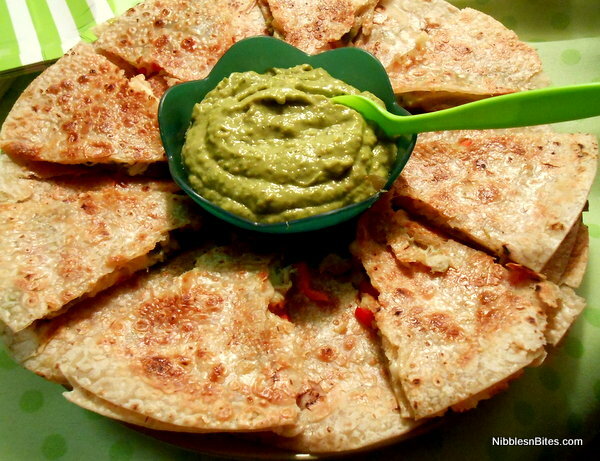 Since there were already green onions in this recipe, I skipped the red onion entirely and used brown rice tortillas instead of flour. I’d heard some not-so-great things about the brown rice wraps in general, but I think for something like quesadillas they worked perfectly and, as a bonus, they stayed crisp even after being refrigerated (which made the leftovers all the easier to munch on). Served with theÂ Tomatillo-Avocado Salsa (p.66) they were both bright and rich, a perfect combination. And the salsa? I’ve been noshing on that all weekend with chips, it might just be my new favorite thing. Can I just say that I love the phrase “cheese-bellied”?! It’s such a fun alternative to the usual stuffed burgers, and fun food is half the battle, sometimes. Anyway, these spicy burgers (which I made slider-size to continue our tapas-esque offerings) get a cooling assist via some of the Bacon-Cotija Guacamole on top. I served them with a tiny crouton of toasted gluten-free bread to keep them just this side of mini-meatball territory. And while the recipe calls for garlic salt, I just used a couple of pinches of Kosher salt and some garlic-infused oil–with lean turkey meat I’ve found you’re going to want a bit of additional fat anyway. How could IÂ not include a dessert item made with avocados?! I was a little apprehensive about this one at the beginning: the creamed butter, sugar, and avocado was a rather icky greyish green color, but as the rest of the ingredients went in the color lightened until there was just the barest tint in the finished dough and none whatsoever in the baked cookies. Chilling is super-important for this dough and even then was very sticky. 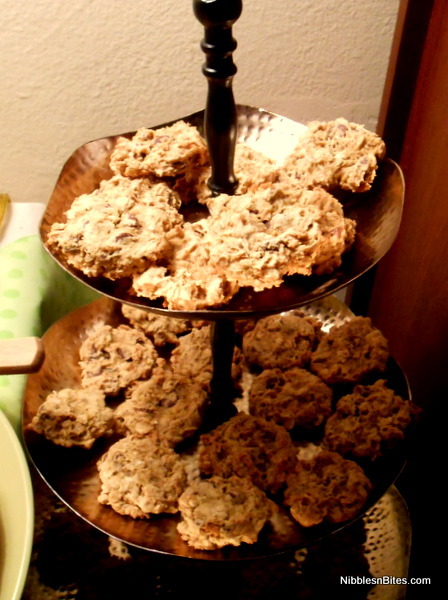 My usual Low-FODMAP flour blend and 3/4 tsp of xanthum gum worked perfectly in these cookies and the avocado (in place of a good portion of the butter) made for dense, moist cookies that everyone absolutely adored. 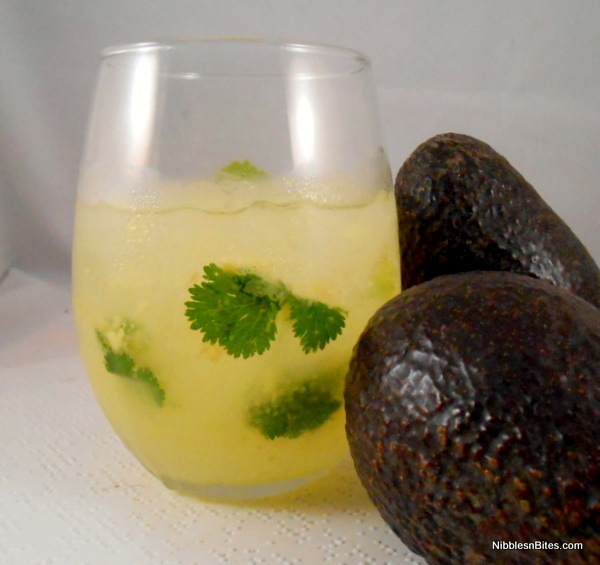 In the bottom of a low-ball or stemless wine glass muddle the cilantro, salt, sugar, and avocado pieces enough to break up the avocado and release some of the oils from the cilantro. 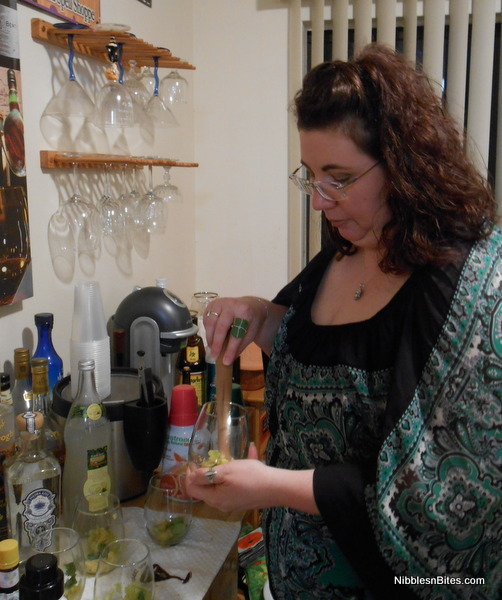 Fill the glass 3/4 full of ice, pour in the tequila and soda and stir to combine. You may want to serve with a spoon so that your guests can make sure not to miss the avocadoey goodness submersed in the drink. Because it was a weeknight and the ladies would be driving home (eventually–we went a full hour over our usual time) and we all had to work the next morning, I wanted a cocktail that had the warmth of a traditional margarita but would still be light enough that no one had to worry about a hangover. The Piedra Azul Blanco is assertive enough to not be missed, even though it’s the smaller of the two liquids in the drink. The soda I used is lightly sweetened with cane sugar (no High-Fructose Corn Syrup here!) and was light and refreshing. I wouldÂ not suggest using the usual lemon-line sodas for this, it would be too cloying; go for something a little nicer and you’ll be well-rewarded. Time absolutely flew by! We must have spent at least an hour eating, drinking, and chatting before putting the movie on amd doing a bit of crafting. Before we knew it, it was 10:30! Â Some doggie-bags were made and I wished my friends a contented “good night and drive safe” before teaming up with Todd (okay, he did most of the heavy-lifting) to un-wreck the kitchen. Finishing 8 dishes in 2 hours makes for a bit of a mess, but thankfully it only looked bad. No one was up til the wee hours scrubbing and polishing anything, I promise! 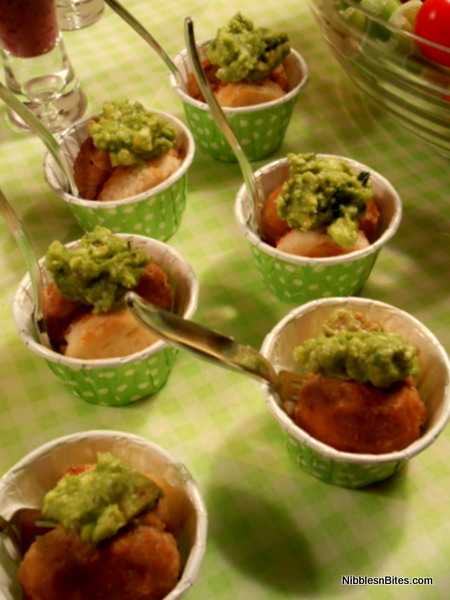 Thank you, Piedra Azul for sponsoring our little Avocado-Fest 2013!